Years ago, I was your typical, broke college student. My apartment’s kitchen offered little more than a loaf of bread, a few snacks and coffee. Yes, coffee – the only necessity when it came to staying awake in class and studying late-night. On a tight budget, I’d learned early on that what wasn’t served hot would have to be reheated, or served cold. And that’s when I discovered that iced coffee was actually quite tasty. Long before it became a menu item in every American coffee shop, I was drinking cold coffee simply because the reheating process – which took place in a small saucepot on the stove – “overcooked” the flavor. Nowadays I use a thermal system for maintaining the temperature of brewed coffee. But by the early afternoon, I remove the carafe’s lid and let it cool to room temperature. In the fridge it goes to help me beat the heat the next afternoon. There are plenty of recipes for iced coffee. Many contain syrups, spices and lots of sugar. I thought I’d share my few tried-and-true go-tos for the perfect cup of ice cold java. If you love Dunkin’ Donut’s Iced Coffee, you can get pretty close right at home. Although they strong-brew, you can save money by using a slightly-heaping tablespoon of grounds for each cup. Once brewed, let the coffee sit and cool to room temperature, then put it in the fridge overnight. The sitting will strengthen the flavor, which is then adjusted with ice and/or coffee creamer. Add sugar as you’d like. I use espresso roast to make this iced beauty. Since these beans produce a better brew, I find them perfect for a cool drink. I brew double-shots from a single-shot of ground beans, then let it all cool. Add the creamer and toss it in the fridge for morning. Pour over ice and let sit for a bit so it weakens just a tad. Like your iced coffee super-strong? 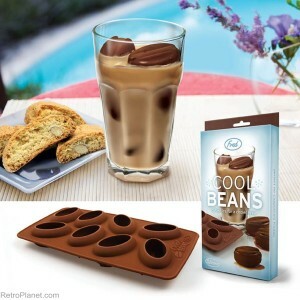 Make ice cubes out of cold coffee as well… There’ll be no watering down. I’m a frugal gal, and since I don’t find this method necessarily creates a better flavor, I only perform this task if I have nothing already prepared. For a strong brew, use about 1-1/2 cups of grounds, a filter and four cups of hot water. Fill an eight-cup carafe about three-fourths with ice, then pour the hot water over the grounds (in the filter) letting it drip over the ice. You have to pour the water slowly (to allow it to seep through the grounds and to prevent shock to the carafe). Many coffee conisseurs not only would shun me for letting hot-brewed coffee sit, they’d argue that cold-brewed coffee is the only way to make iced coffee. With high-quality roasts, I tend to agree. But when it comes to time and money, the above methods are easy fallbacks. With the cold-brewed method you soak coffee grounds in water for 12 or more hours, then filter out the grounds. This does produce a less acidic beverage and gives a pure, natural flavor (which is why you need to use the best beans you can find). Then there’s the old college-method – a method even my father uses. He simply takes the cold pot of coffee he left sitting out and dumps it over ice. 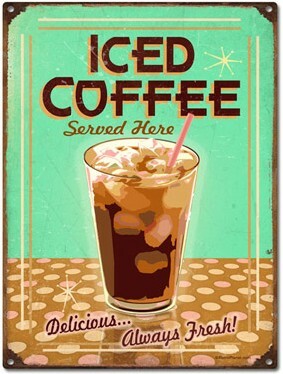 Are you an iced coffee lover? What’s your favorite method for creating this great, cool-down beverage? Share your recipes and favorite coffee drinks below.